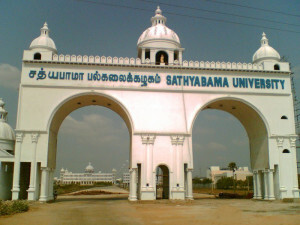 SATHYABAMA UNIVERSITY, CHENNAI Sathyabama University was established under section (3) of the UGC Act, 1956 (A Christian Minority Institution) which was formerly known as Sathyabama Engineering College established by JEPPIAAR EDUCATIONAL TRUST in 1987. It is a pioneer institute imparting knowledge in the areas of engineering, science, technology and education. The institution’s progress and contribution in the field of technical education for over two decades made the Ministry of Human Resources Development, Govt. of India to grant Deemed University status on 16th July , 2001 and University status on 13th September , 2006 under section(3) of the UGC Act, 1956. Sathyabama University under the dynamic leadership of Honorable Chancellor Colonel Dr. JEPPIAAR, Madam Chancellor Remibai Jeppiaar, has been strengthening university development activities to bring fruits of research for betterment of the society with the able support and valuable guidance of Dr. Marie Johnson and Dr. Mariazeena Johnson, Directors, Dr. B.Sheela Rani, Vice-Chancellor,Dr. T.Sasipraba, Dean, (Publications & Conferences) , Dr. P.E.Sankaranarayanan, Dean (Academic Research), Dr. S.S.Rau, Registrar and Dr. K.V.Narayanan, Controller of Examinations. The University offers courses in 24 branches of Engineering at the UG level and 24 courses at PG level in addition to Sciences, MBA, MCA and Ph.D programmes in all disciplines. The University has excellent infrastructural facilities including modern laboratories, library with video, Internet and other general amenities. To its credit it has been awarded as Category ” A ” University by Ministry of Human Resource Developemnt ( MHRD ) , Government of India . The University has undertaken various sponsored and collaborative Research and Development projects funded by national organizations such as Indian Space Research Organisation (ISRO), Department of Science and Technology (DST), Indira Gandhi Centre for Atomic Research (IGCAR), Defence Research and Development Organisation (DRDO), National Institute of Ocean Technology (NIOT), Ministry of Environment and Forests (MoEF) etc,. The University holds great promise to expand the applications of space technology, benefiting the common man and enriching the quality of life in association with Indian Space Research Organization (ISRO) the university is successfully conducting non formal education programmes through 18 Village Resource Centres (VRCs) all over the state.